It can be an ottoman for your feet, a quick seat, a makeshift side table, or just a glob in the corner to add to your decor. 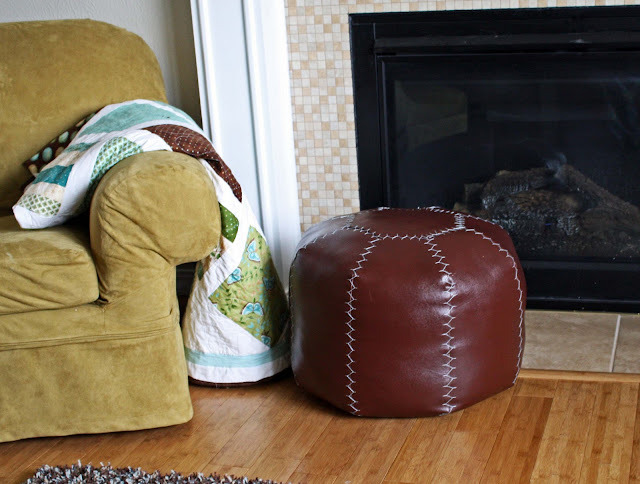 I first saw this from Angie at Country Chic Cottage where she made two: one cool one from vintage coffee sacks and another multi-patterned one. 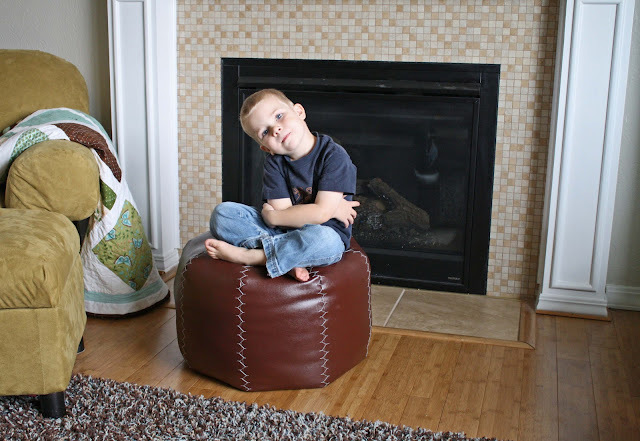 Better Homes and Garden had a free pattern/ tutorial to make a pouf on their online magazine. You have to "subscribe" before you can download your pattern, but it's free. Here's the link to the tutorial. The pattern instructions say to use burlap linen, but I'm kind of over the burlap craze, I have it in my house and like it, but decided not to add more burlap. Also, this thing can not go in the washer, and my kids would gave gooey hand prints all over it. So I decided to go with vinyl, durable and wipeable. The pattern needs 2 yards. I bought a mid-range vinyl for this project. The cheapest stuff is more like tablecloth thin, rippable vinyl. Then I got a thicker version that was $17.00/ yard at joann's and I used a 50% off coupon. They had this nicer faux leather vinyl for $23.00 but it was too costly, I went with the middle option. 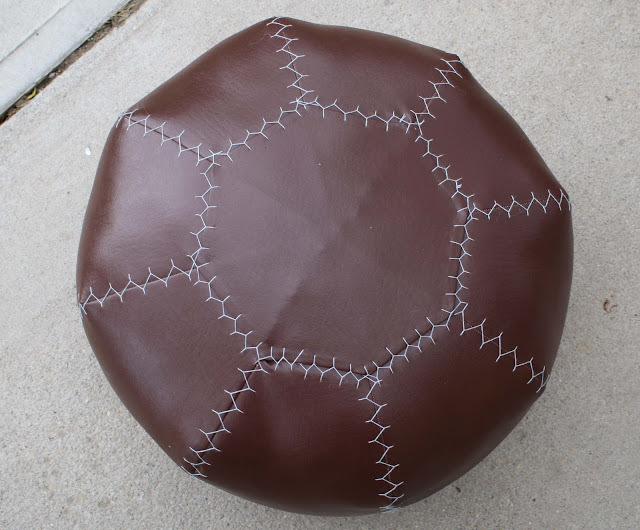 The pattern has you sew 8 pieces together for the pouf, then add the octagon caps on top. You can kind of see the seams under this cap, where all the seams join. You just plop the octagon cap on and stitch it to the body on the top and bottom. To fill my pouf, I basically cleaned out my linen closet. We had lots of old mangy towels to get rid of that made a thick base. I also went through all my sewing scraps and threw the ones I most likely won't use in the pouf. For the sides and top I jammed in a bunch of polyfill batting like the pattern recommends. Packing the sides with batting helps prevent the "bean bag cellulite" look as the scraps/ towels/ etc used to fill it can layer weird. I really stuffed the crap out of this. I wanted it to support adults without collapsing in much. I used an aqua blue embroidery floss, to match our living room. Sewing the moroccan top-stitching pattern was a little more challenging with thicker vinyl, but with a thimble it wasn't too bad. 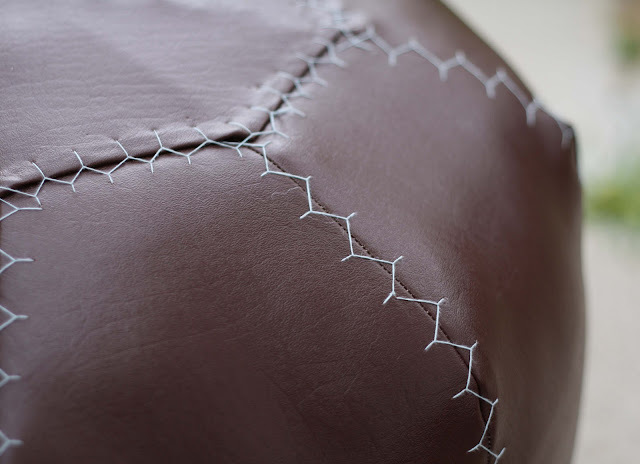 After a few, you get the rhythm of the stitching and get get going pretty steadily. In the end, this pouf cost just under $20.00. I already had a huge box of Polyfil so I didn't have to buy any. We use it mainly at our coffee table we built last year. It's in our living room where our son does most of his artistic/ quiet stuff. Lately he's been into board games...a lot. 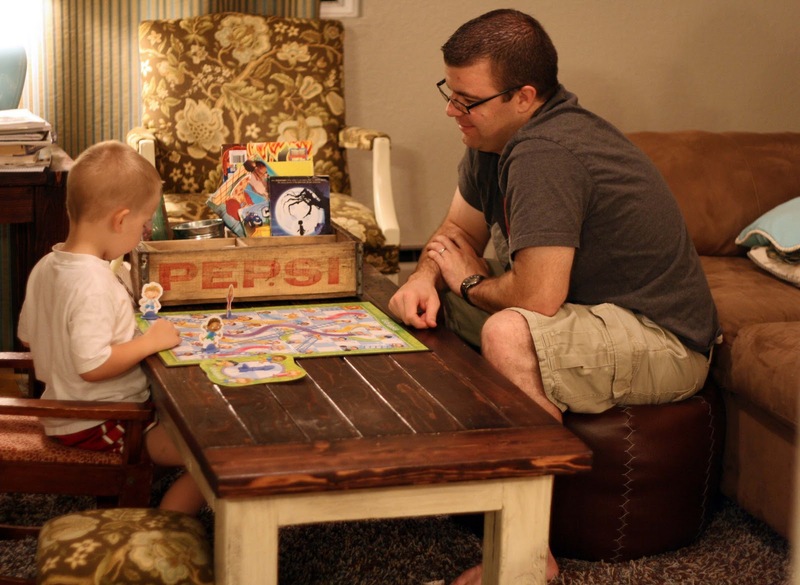 I have to say my husband and I are kind of sick of Battleship, Candyland and Chutes and Ladders. 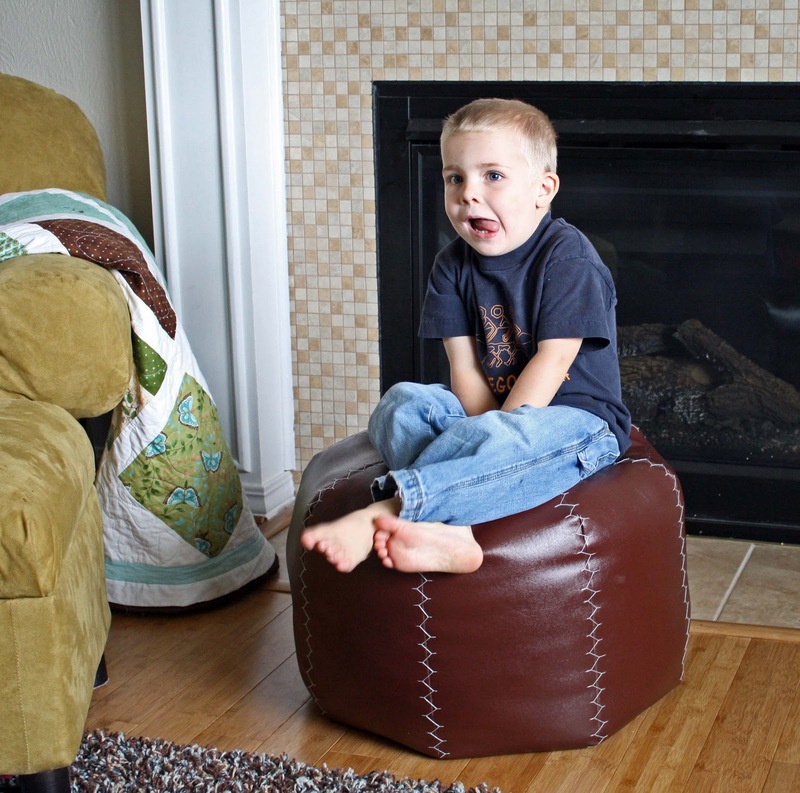 We use the pouf to sit on, as the floor is too low, chairs are too high, and we're too lazy to move the couch or table to get them close enough to use. I thought it would be fun to make a few if you have a play room and could use bright colors like an bright apple green. It turned out wonderful! 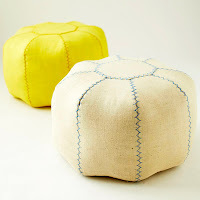 Looks like something you'd see accessorizing a living room in a magazine!I love the pattern of stitching you used. Brilliant to stuff it with old towels and linens, I bet that helps strengthen it a lot. I pinned this! 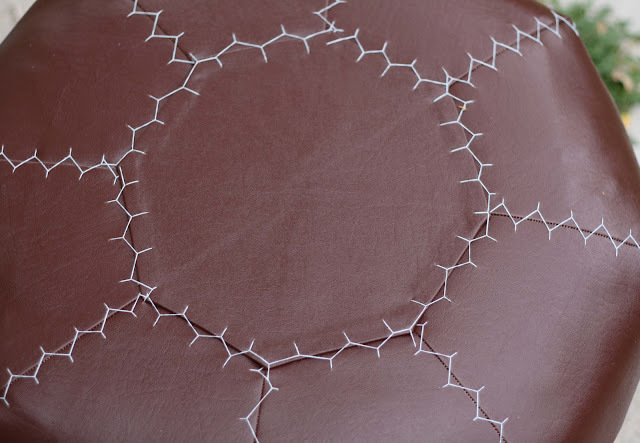 That is good looking DIY furniture that even I could do! Jessica! I love this! It looks so fantastic. I can't wait to make one for our living room! Wow, I love it! I'm going to go check out the pattern. Thanks for sharing. this is adorable, and useful! Gotta love that! wow, you're turned out so well. i've seen others make on out of the pattern, and no offense to them, but yours seems so much more non-homemade. makes me want to try, though i'm sure mine will turn out looking home made! I couldn't find anywhere that says what the final dimensions of the pouf are. Can you give me an estimate of the completed size?